If you're still wondering which iOS FLAC player to choose – wonder no longer. Just read below. We all have been in this situation – our top favorite band releases a new hot album, and we instantly want to listen to it in High Quality because, well, we don't want our first impression to get ruined by the poorness of the sound. There's another, more simple way, which is streaming via Spotify, Apple Music or any other streaming service at ugly 128 kbps, but you don't want to make good folk feel sad, do you? I'm talking about Snoop Dogg, Hans Zimmer, Quincy Jones and the rest who made a great short film called The Distortion of Sound which tells us why low-quality music is a crime against art. I remember in 2013 when Daft Punk released Random Access Memories I found it in FLAC on the web and had to encounter some terrible news – neither my iPhone nor Mac can support FLAC, so I had to look for alternative options to listen to it – "Can iTunes play FLAC?". Regardless whether you use online streamings like Spotify, Google Music or buy songs from iTunes store, you don't hear the full power of the sound, and you can't properly appreciate what artists wanted to tell you through music. If it's the first time you are wondering how to listen to FLAC on iPhone, roughly saying, you have two option. 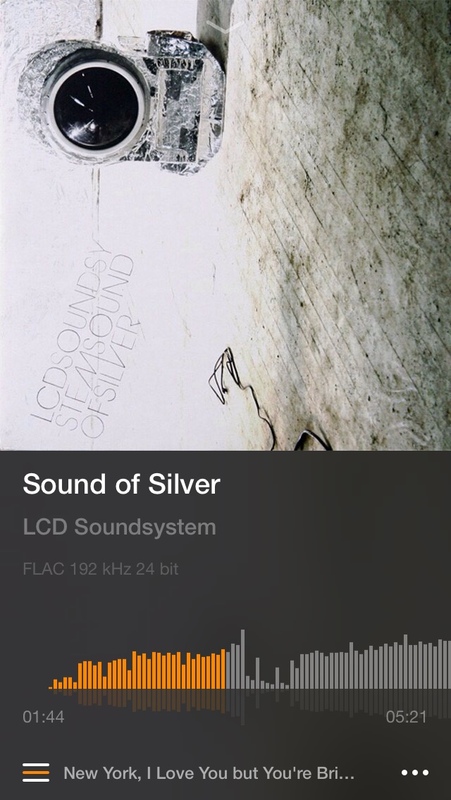 You either convert FLAC to ALAC (Apple Lossless Audio Codec) or you find a decent iOS FLAC Player. Convert you FLACs to ALACs. Judging by their names, you must've realized that these lossless formats are not that different in their nature, so if you convert them, there will be little sound compression. If your music collecting doesn't include thousand of FLAC tracks, it makes perfect sense to convert those files. There's a vast range of tools that will help you do it. I prefer Max and XLD myself. Both programs support many codecs and formats nad ensure that the loss of quality is not that dramatic. XLD can also help you rip a CD if you feel like doing it. You won't be disappointed with Max and XLD I can tell you that. Result – the problem of playing FLACs on iPhone is gone. It's a much more sensible choice for those who have a vast music collection of many audio formats. Plus, it's a better solution if you don't happen to be a devoted iTunes fan. Considering FLAC is catching on, the number of apps that can play it is also growing rapidly. I suggest you chose an audio player that is capable of playing both lossy and lossless formats. If you have no idea what lossy and lossless stand for, you can read my article on FLAC vs. MP3 to get a better picture of what these terms mean. A player that is likely to meet all your requirements is VOX Music Player for Mac & iPhone. It's an excellent iOS FLAC Player that aims to carry out a music revolution so that everybody listens to Hi-Res music. VOX is a perfect alternative if you tend to convert FLAC to any iTunes supported format to listen to it on iPhone. It's a solid leader among iOS audio players as well as players for Mac. So what makes VOX a great iOS FLAC player? VOX is an easy-to-use yet powerful audio player with a minimalistic design developed by music lovers for music lovers. It's as simple as that. The playback is a key feature of the player since there are no limits to the formats supported (VOX can play both lossy and lossless) and due to its new sound enhancing BASS technology your music is going to sound like never before. I reckon most users expect a perfect iOS FLAC player to be able to play their music, and nothing more. That's exactly what VOX does. The simple interface has everything you want and doesn't waste much space. As you can see, you have access to all the features you could expect from a decent iOS FLAC player. Additional features like EQ or Last.fm scrobbling only enhance your music experience and don't stand in your way when you just want to listen to your favorite tunes. I understand that Hi-Res music might take too much space on your Apple device. To solve this issue, VOX developers designed an unlimited music cloud just for your collection. Music clouds (sometimes referred to as music lockers) are great solutions to store music online. The era of HDDs is long gone, streaming services offer more quantity than quality, so it seems pretty apparent that music clouds have won our favor. Regardless of how much music you have VOX Music Cloud can store all of it. The key feature is that it syncs Mac and iPhone making to possible to listen to all your music with VOX. And yes, it's available to VOX users exclusively. VOX Premium with VOX Cloud makes a perfect combination to call it the best iOS FLAC player. It's an ideal audio player for anybody who values quality and functionality. VOX Cloud stores all your music, VOX Players play it. Start uploading music to VOX Cloud. Create VOX Premium account today. 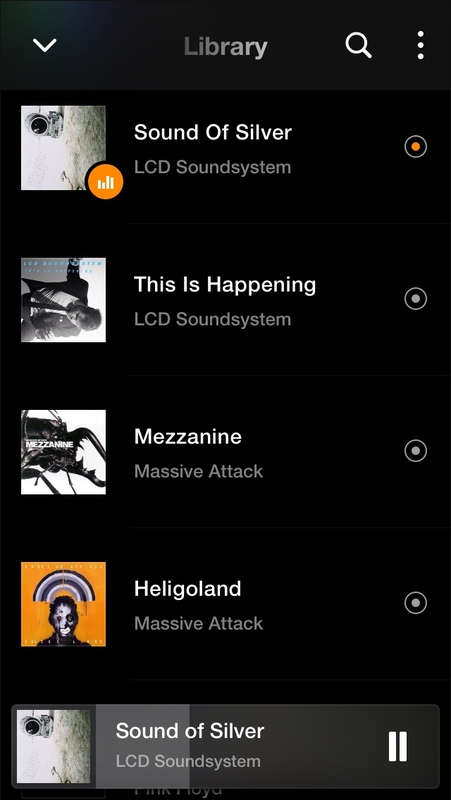 VOX Music Player streams from VOX Cloud, but the good news is that no file is compressed or converted. It means that you will always be listening to the original sound. Just look how simple it is to enjoy LCD Soundsystem in Hi-Res. Soundcloud, for instance, converts everything you upload to MP3 at 128 kbps. I realize that you might not always have Wi-Fi around or enough cellular data to stream Hi-Res music so to prevent the silence you can always cache your songs or complete albums to listen to them online. As for additional feature, there's SoundCloud and Spotify streaming, which is very useful when you want to make a playlist with songs from these services. Then you have 30,000+ radio stations and a customizable EQ with some built-in presets for better music experience. All this proves that VOX is a perfect choice if you're looking for a iOS FLAC Player. The times have changed, and it's the right moment to start listening to Hi-Res music. VOX Music Player for Mac & iPhone is by far the best iOS FLAC player as it plays most audio formats, synchronizes iPhone and Mac music libraries, has Last.fm scrobbling and provides the best playback enhanced by a new BASS technology. VOX Premium with VOX Cloud is a perfect combination for everybody who's in love with music as much as I am. Enjoy the vibes with VOX Music Player. FLAC vs. MP3. Is FLAC better than MP3? The best iPhone music player. It's VOX! How to convert FLAC to Apple lossless? Read on to find out! Modern battles: What is the best way to download music to your iPhone?